The Little White Salmon River, located in Skamania County in south central Washington, drains approximately 134 square miles and flows out of the Monte Cristo Range. It originates in the Gifford Pinchot National Forest and drops south for 19 miles into Drano Lake in the Columbia River Gorge. The section of river between The Willard National Fish Hatchery and Drano Lake is arguably one of the best class V day runs in the country. In the late 1980’s Bob Coombs was among the first to explore the river and as the interest with the Little White grew more paddlers put on and picked their way down the run. The next year, 1990, paddlers such as Ron Reynier, Bill Bowey, Jeff Bennett, Phil Unsworth, and Bill Pooley were running it on a regular basis and picking off the unrun rapids one by one. By 1992-93 other paddlers such as Charlie Kirsch, Cal Diller, Elizabeth Tarr, Roger Stewart, Ron Blanchett, Jed Weingarten, and others were getting the run dialed in while Bowey, Weingarten, and Unsworth were pushing the limits of higher water levels. By mid 1993 all the rapids had been run with the exception of Stovepipe and The Big Falls. Stovepipe was run by early 1994 and that just left the ‘The Big Falls’. At this point paddlers were starting to refer to it as ‘The Altar’ :an elevated place or structure, as a mound or platform, at which religious rites are performed or on which sacrifices are offered to gods, ancestors, etc. Since no one ran drops that big back then ‘The Altar’ fit the final drop on this run as paddlers would take in the beauty and make their way around it on each trip, but that reference didn’t last long. Weingarten had broken his boat on the run and stuffed a log in the cockpit and sent it off as a probe. It had a great line off the Altar, then one week later local paddler Jens Mullen decided to solve the last piece of the puzzle and after running it he named the big drop Spirit Falls and it properly fit. Jed Weingarten: When I got back to my boat, it had a big crack in the hull. So, I found a big log, stuck in the cockpit, and sent the boat off to see what would happen. It had a sweet line off of the Altar, but broke into 3 separated pieces in Chaos (which hadn’t been named yet either!). 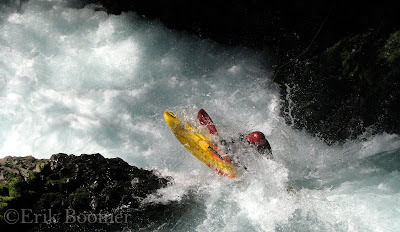 *and according to early sources, Wishbone Falls was run down the right channel during the first few times that paddlers decided to drop into the lower gorge. Since then paddlers have stuck with the left channel. 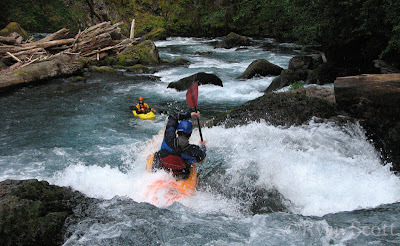 *Todd Anderson and Tommy Fredricks running the right channel at Wishbone Falls in early 2006. *Ross Henry and Todd Anderson throwing some of the biggest free-wheels I’ve seen off of Boulder Sluice Rapid in early 2007. *Todd Anderson free-wheeling Stovepipe in 2007. 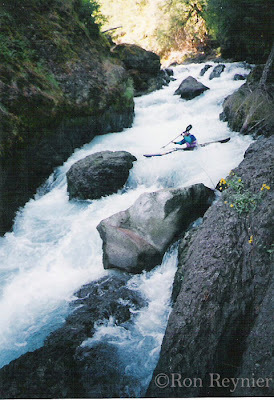 *L.J Groth’s free-wheel off Spirit Falls in 2006 – same day as the race. *Locals runing car (put-in) to car (take-out) in under 40 minutes. *Highest known complete descent by Erik Boomer in 2006 at 5.0 feet. Thanks to Ron Reynier, Jeff Bennett, and Jed Weingarten for the early history and all the Photographers for the photos.